GCE is a shared services partner dedicated to serving colleges and universities. GCE’s leadership team has been leading educational transformation since 1983, and supports partner institutions’ students through operational functions that achieve organizational growth and student success. GCE can design programs that serve your diverse student body on campus or online at the undergraduate, master, and doctoral program levels. These functions support the complete student life cycle including strategic enrollment management, academic counseling, financial services, learning management system support, technical support, student information system support, compliance, marketing, human resources, classroom operations, curriculum development, faculty recruitment and training, among others. Grand Canyon University (GCU) is Arizona’s premier, nonprofit Christian university committed to making a private education affordable. Established in 1949, GCU has become an unprecedented success story and is defined as a leader in education and an anchor institution in its community. Today, GCU helps over 19,000* on-campus students and 70,000 online students find their purpose and prepare for a career that makes a difference. We offer over 200 academic programs including 150 online academic programs. GCU is dedicated to innovating higher education and transforming the community to serve the greater good and contribute to the future. 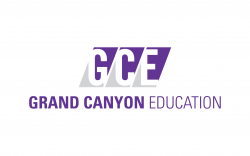 Grand Canyon Education, Inc. (GCE) is excited support this amazing growth and help GCU prepare for the next chapter of their incredible journey to help students find their purpose. GCU selected GCE to partner as an online program provider to support GCU’s mission, students, faculty and staff. By selecting GCE, GCU is assured of furthering its mission through the companies’ complimentary visions and ethical standards and the efficient use of strategic resources that support teaching and assessment of student learning. At GCE, we are pleased to offer rewarding careers for professionals with a variety of skillsets. These roles help change lives daily and support our partner in their educational goals. We are committed to ethical values and practices, with an emphasis on building a supportive work environment and offering job advancement opportunities to top-performing employees. GCE employees enjoy the following benefits: medical, dental, vision, life and disability insurance, flexible spending accounts, a 401(k) savings plan, team-building activities, discounted event tickets, onsite gym facilities, discounts on GCU swap, financial planning services and worship events with our Corporate Chaplin. Working at GCE offers more than just a paycheck and generous benefits, it offers the opportunity to contribute toward the greater good and experience something greater than yourself. In addition to four weeks of paid time off within the first year and 11 ½ paid holidays, employees may take up to two additional paid days off to volunteer. Many employees choose to volunteer with our partner organization GCU to rehabilitate local homes surrounding GCU with our partner Habitat for Humanity and support this great cause benefitting our neighborhoods.